Our body comes into contact with numerous toxic chemicals everyday. Some you ingest, some you clean your home with and others you slather on to beautify and protect your skin. However, you may never have thought that these chemicals affect your micronutrient levels. 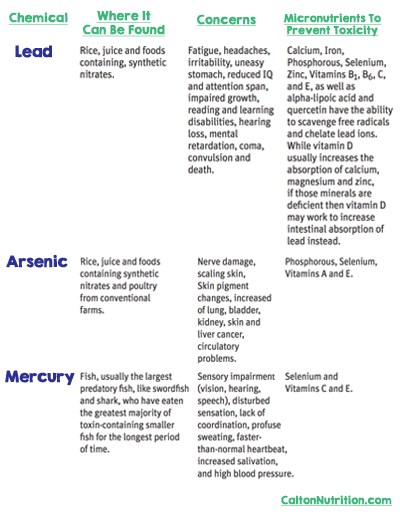 Could your choice of rice, seafood and poultry, or your preferred shampoo, dish soap, and toothpaste be causing your body to utilize the micronutrients you ingest for detoxification, leaving you at risk for other conditions caused by their deficiencies? While we agree that this image makes a strong and powerful statement, we also think it's important for you to know that the problem isn't in ingesting one toxic ingredient. Instead, it lies in ingesting, cleaning with, and lathering up with MANY toxic chemicals throughout the day, every single day. The build up of these chemicals in our bodies over time is where the real problem lies. We are essentially living in a toxic soup. Living in this modern, industrialized world means that many things in our lives have been made simpler and more productive. On the other hand, recent research shows that this “simpler” existence may have some fairly unwanted consequences. First, it has caused a contamination of the water supply due to industrialized runoff. Additionally, the desire to grow animals for human consumption at an unnatural pace has found use of toxic chemicals as a means to increase poultry size and potential profits. 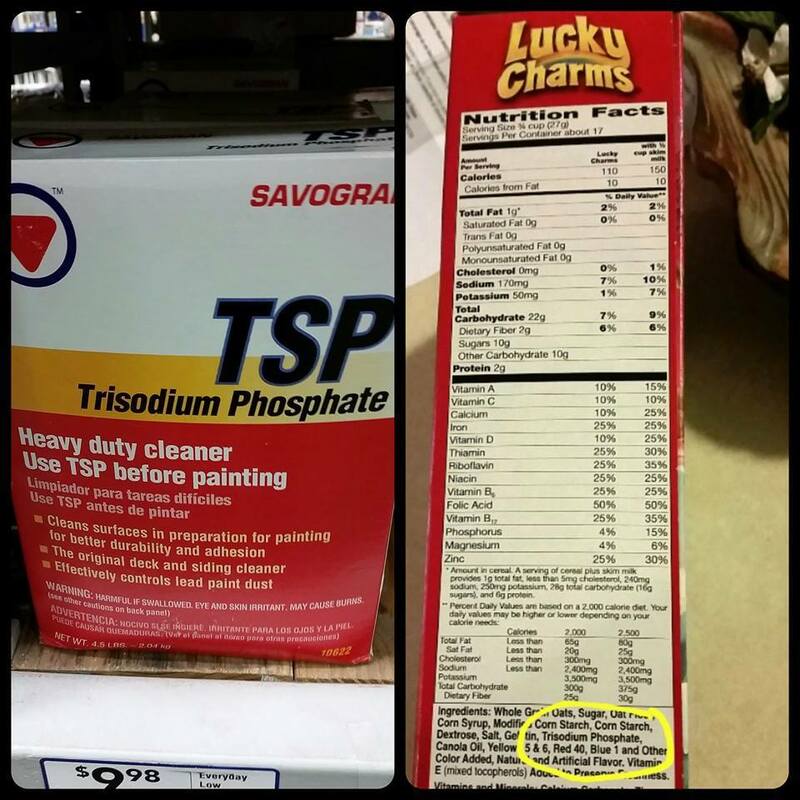 For these and many other reasons, we find our modern foods contaminated with lead, arsenic and mercury. Did you know that nutritional science has shown micronutrients to be your body’s best defense from these dangerous toxic chemicals? That’s right. 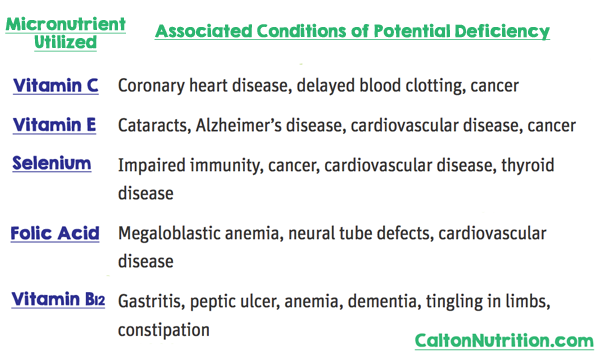 As it turns out, micronutrients work as the body’s natural detoxifiers, affecting both the absorption and excretion of these toxic contaminants. Take some time to read the table below. Where is your highest exposure to these toxic chemicals coming from? Do you think you could reduce your exposure by limiting your intake of their sources? Remember, you don’t have to be an extremist, and frankly we would not want you to stop eating fish because of possible mercury contamination. Just remember that being sufficient in your essential micronutrients is your best defense against the inevitable reality of toxic exposure. Another thing to consider, many household and personal care products are loaded with unpronounceable ingredients that have been show to have deleterious side effects. Have you ever considered how many of these potentially dangerous items you come into contact with everyday? For example, both the triclosan, commonly found in antibacterial soaps, as well as the sodium lauryl sulfate (SLS), found in many toothpastes, laundry detergents, hair coloring, shampoos and other foaming products, have been shown to cause the formation of dioxins. According to the Environmental Working Group’s Skin Deep: Cosmetic Safety Reviews research, studies on SLS have shown to potentially cause irritation of the skin and eyes, organ toxicity, developmental and reproductive toxicity, neurotoxicity, endocrine disruption, ecotoxicology, and biochemical or cellular changes, as well as possible DNA mutations and cancer. They explain that the danger is based on the level of exposure, but considering many of these products are used at least once a day, researchers believe that the build up over a few years could be quite high. In order to fight o the effects from only these two ingredients, your body would need to use a host of vitamins and minerals. As you can see, there are vast ramifications of the introduction of only these two toxic chemicals. Would it surprise you to know that according to the United Nations Environmental Programme (UNEP) approximately 70,000 chemicals are commonly used across the world, with 1,000 new chemicals being introduced every year? Imagine the micronutrients your body must utilize in order to protect you from all of them. If we look at this sample of micronutrients needed to protect you from these two toxic chemicals, we must consider the ramification of their potentially becoming depleted. Now that you have a preview of what we're talking about when we say we're living in a toxic soup.. we encourage you to start looking for places you can make changes. Are you micronutrient sufficient? We've developed a quiz to help you find out! And if not, you should be following the ABCs of supplementation. Are there household items or beauty products you can replace? Foods you can swap for better alternatives? Start small! If you've yet to read our book Rich Food Poor Food, we take you through the grocery store aisle by aisle breaking down where you can find the best Rich Foods, and what companies provide them. Questions? Let us know!